Thermocouple installation may sound like a difficult project, but it can usually be done with only a few tools, and takes less than an hour to complete. If you have a Whirlpool water heater, the process may be slightly different from the instructions provided here, but this general guide will be sufficient to help you figure out the process. If the pilot light will not remain lit and you have gas flow, the thermocouple probably needs to be replaced or at the very least, cleaned. A universal thermocouple is inexpensive and can be purchased at most major hardware stores. Replacing a thermocouple is easier than you think. The thermocouple is a special sensing tube on gas water heaters that senses when the pilot light has flame, and shuts off the gas to the unit when the pilot has been extinguished. The thermocouple and pilot light tubes both extend from the gas control valve to the burning compartment. When the pilot is lit, it creates heat at the end of the thermocouple, which in turns enables gas flow to the pilot and the burner. Disengaging the thermocouple is why you have to hold down the button for the pilot when lighting it. Before the installation of a new thermocouple, check the line for obstructions. A blockage in the thermocouple or pilot tubes can cause the same symptoms as a failed thermocouple. If there is no air flow when you blow through the tube, it is probably clogged. To remove debris from the line, push a piece of wire all the way through the tube and then apply air pressure to clean out any dust or trash left behind. Alternatively, you can use a small piece of sandpaper to clean the thermocouple. Turn off the gas leading to your water heater. Most units will have an inline valve for the gas inlet, but you can turn off the main gas line if one is not available. Turn the gas control valve to the OFF position. Using open faced wrenches or an adjustable wrench, remove the thermocouple line, the gas line, and the line for the pilot light. The thermocouple is usually a left hand thread, while the main gas line uses a right hand thread. The pilot light tube is generally a right hand thread, but it may be either one, depending on the model of water heater being repaired. Some models have a protective cover over the burner compartment that has to be removed, typically those with a push button pilot igniter. Remove the cover, if present. The burner, with the pilot and thermocouple tubes attached, sits loosely in the compartment. If the burner component does not pull out easily, there may be clips that have to be released before the burner will move. 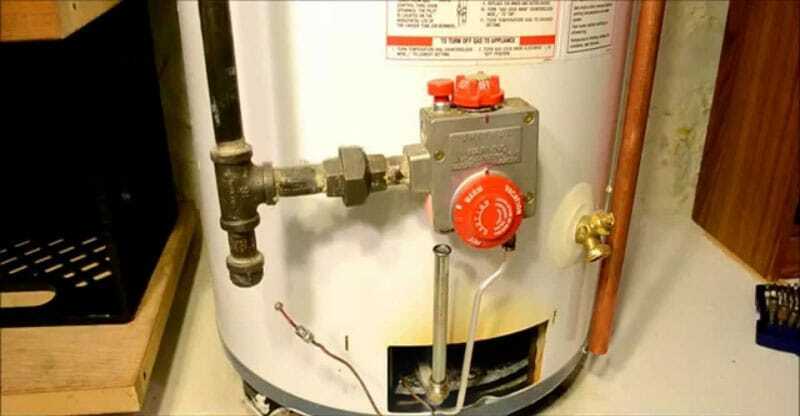 Slide the entire burner component out of the water heater. Remove the thermocouple from the burner. In most cases, no tools are required to do this. The thermocouple may be connected to the pilot tube with clips that hold it in the correct position. If the thermocouple does not slide out of the pilot assembly easily, disengage the clips and and try again. Reverse the steps to install your new thermocouple. Remember that one or more of the fittings uses a left hand thread and must be turned counter clockwise to install. Be sure not to cross the threads and secure all three fittings tightly. Turn the gas on leading to the water heater. Re-light the pilot according to the instructions printed on it, and set the temperature control valve to the desired temperature. Apply soapy water around the three fittings, looking for bubbles that indicate a gas leak. Check out the video below which shows you how to replace your thermocouple. I replaced the thermocouple in our water heater and the pilot lit but when it reaches the temperature to shut off it also shuts off the pilot. Why?